The UKRAA Magnetometer is a sensitive instrument for measuring changes in the Earth's magnetic field. The unit was designed by John Cook and uses a Honeywell magneto-resistive IC as the sensor. The instrument is a 2-axis magnetometer measuring changes in the X&Z direction on one channel and the Y direction on the other channel. The unit is not intended for use in “compass” mode where actual field vectors are measured. It is intended for the board to mounted so that the face of the printed circuit board is normal to the local field. This mechanical geometric nulling allows a very high gain amplifier to be used resulting in an extremely sensitive instrument. The unit exports its readings as a pair of voltages in the 0 to 5Volt range, and some form of recorder will be needed to store and display these. A number of external Analogue to Digital converters are available which may be employed for this purpose. The on board PIC controller also digitises the readings which are also made available via an industry standard I2C bus. 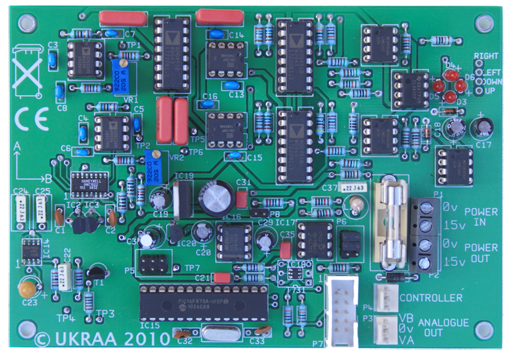 UKRAA also offers a micro-controller board and software to control the range setting and collect measurements from the Magnetometer via the I2C bus. Controller has sufficient on board RAM to store several days readings. The controller communicates with a PC via a serial link to download stored data for display and analysis using the Starbase program. Starbase is an open source multi-platform Observatory management program which is available free and a download facility is available on this site. The unit and the software is supported UKRAA and by B.A.A Radio Astronomy Group members. We have added a bookshop to our Online Store. The bookshop includes Jeff Lashley's recently published book 'The Radio Sky and How to Observe It' and other radio astronomy titles. 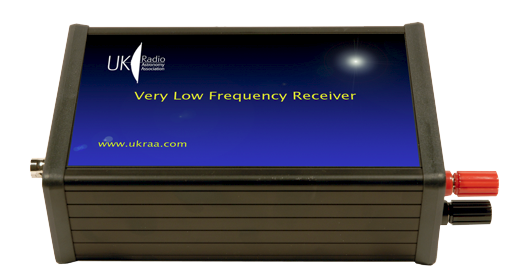 The UKRAA Very Low Frequency (VLF) Receiver is designed to indirectly record Sudden Ionospheric Disturbances (SIDs) induced by solar flares. It does this by monitoring transmissions from Earth-based beacons, which are affected by changes in the ionosphere, giving an indication of events on the Sun. The main motivation for this work is to correlate the radio observations of solar activity with those from optical observatories, and to follow the cycle of sunspots as they appear. The receiver was originally designed by Peter King for the British Astronomical Association (BAA) Radio Astronomy group (RAG), and modified into its current form by John Cook. The receiver uses a cascode input stage that buffers the tuned aerial and isolates it from the narrow band filter. The input stage provides a small gain. The filter circuit uses four operational amplifiers (opamps), and is based on a circuit used in analogue computing. While it is greedy on opamps, it provides nearly independent control of gain, frequency and Q (a measure of the bandwidth). The receiver has a tuning range of 12kHz to 35kHz and provides a variable output voltage of 0 - 2.5v and 0 - 5v. The output voltage may be fed to any data logger or digital multimeter or suitably equipped computer. It may be connected to a UKRAA Controller which is managed with the Starbase software (provided free of licensing charge by UKRAA) allowing observations to be stored centrally and shared with other observers or alternatively it may be used with the popular Radio Sky-Pipe data logging software, but this would require extra components. The receiver requires a supply of 15 Volts DC at 35mA. UKRAA supplies a small loop aerial and tuning unit suitable for indoor use in moderate signal areas. Larger outdoor tuned aerials of either the loop, or "long wire" format may improve reception, and possibly reduce interference. The receiver is supplemented with various other items of equipment such as the VLF Signal Generator tuned for 23.4kHz and an Exciter loop to test the directional sensitivity of the VLF Aerial.